New Delhi: Prime Minister Narendra Modi’s home state Gujarat has topped an official ranking of states measured for how successful they have been in rolling out regulatory reforms to facilitate the ease of doing business—a key priority in the federal government’s effort to promote manufacturing. Gujarat is followed in the top five spots by Andhra Pradesh, Jharkhand, Chhattisgarh and Madhya Pradesh. The last three states, like Gujarat, are ruled by Modi’s Bharatiya Janata Party, while Andhra Pradesh is governed by the Telugu Desam Party, an ally of the BJP. 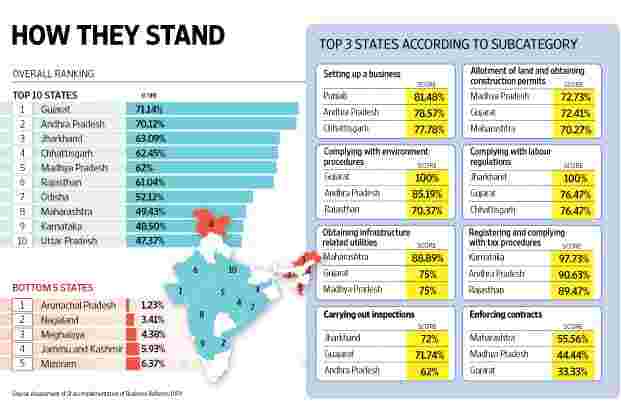 Poll-bound Bihar is placed 21st and Arunachal Pradesh took bottom place in the survey sponsored by the department of industrial policy and promotion (DIPP). The World Bank and consulting firm KPMG were associated with the survey. The DIPP listed eight areas in which states were ranked: setting up a business, allotment of land and obtaining construction permits, complying with environmental procedures, complying with labour regulations, obtaining infrastructure-related utilities, registering and complying with tax procedures, carrying out inspections, and enforcing contracts. Among these eight parameters, Gujarat topped the category of complying with environmental procedures and stood second in four. The study said that while the implementation of 98 suggested reforms by states was encouraging, no one was able to score an overall implementation status of 75% to take the so-called leader status. Instead, seven states—Andhra Pradesh, Chhattisgarh, Gujarat, Jharkhand, Madhya Pradesh, Odisha and Rajasthan—that scored between 50 and 75% were accorded the aspiring leaders title. Punjab leads in the area of setting up a business, as it offers an online single-window system for registrations and licences that cover most of the regulatory services in the country. Maharashtra was ranked highest in obtaining infrastructure-related utilities, with clearly defined timelines for electricity, water and sewage connections, and a reformed electricity connection application process. Karnataka received the highest score on registering and complying with tax procedures due to its comprehensive automation and process re-engineering efforts. Jharkhand led the field in carrying out inspections, since its labour management system implementation has also focused on inspections reform. However, the report also flags a multitude of reforms that still need to be implemented effectively by most states. For instance, a majority of states are yet to offer electronic courts to resolve commercial disputes, including infrastructure to allow for electronic filing of disputes, issuance of electronic summons, online payments, electronic cause lists and digitally signed court orders. Twenty-six states are yet to introduce reforms on a wide range of labour inspections under various Acts, or on inspections related to building permits. About 25 states lack online availability of information on land banks, and use of geographical information systems (GIS) to track industrial land parcels. Attempts to lighten the regulatory burden on business at the state level are an important component of Modi’s flagship programmes Make in India and Ease of Doing Business in India, and prompted the DIPP exercise. On 8 June, the department released a framework to assess and rank states in terms of ease of doing business on 98 parameters. Its aim was to assess various factors enabling the ease of doing business in each state, and to make comparisons. The move is also expected to encourage states to carry out reforms in areas such as land acquisition and labour laws, where the Modi-led Union government has found it difficult to make legislative headway. This assessment, the first of its kind, was conducted to take stock of reforms implemented by states between 1 January and 30 June 2015. Questionnaires were sent to states in June and after receiving the responses, consultants from KPMG visited states to check on the reported reforms. In August, the World Bank and KPMG reviewed the database to ensure robustness and veracity. N. Chandrababu Naidu, Andhra Pradesh chief minister, tweeted: “Delighted to announce that Andhra Pradesh has been ranked 2nd in India on ‘Ease of Doing Business’.... We’re making an impact." “We are now targeting the number one position. We will soon make it to the list of ‘leaders’ category by falling in the 76-98 point score card," Naidu said. Rajasthan chief minister Vasundhara Raje said the ranking was a defining moment for her state, which ranked sixth. “We owe it to our youth to make Rajasthan a fertile habitat for job creation. This ranking is just a down payment for this long journey. We are only in the first phase of a multi-year strategic plan to make Rajasthan a job magnet," she added. Gujarat’s health and urban development minister Shankar Chaudhary tweeted: “Good governance reflected once again." Arindam Guha, senior director at Deloitte Haskins and Sells Llp in India, said that with this assessment proposed to be an annual exercise, all states were expected to try and improve their scores and ranking, which would promote competitive federalism and attract private investment since a study of this nature is likely to influence investor perception. “However, in addition to the ease of doing business ranking, the other factors which will be equally important in attracting investments to states will be their mineral resources, existence of an urban-industrial ecosystem, infrastructure connectivity in terms of roads, ports, airports etc. which are not captured in the current study," he added.